Justice Siggins was appointed presiding justice of Division Three of the Court of Appeal by Governor Brown in July 2018, and first joined the court as an associate justice in 2006. Prior to becoming an appellate justice, he served as the Legal Affairs Secretary to Governor Arnold Schwarzenegger (2003-2005) and the Governor’s Interim Chief of Staff (September to November 2005). Before going to work for Governor Schwarzenegger, Justice Siggins was employed in the Attorney General's Office of the California Department of Justice from 1988 until 2003. Justice Siggins began his career in the Attorney General's Office as a deputy attorney general responsible for the defense of correctional officials and agencies in trials and appeals challenging state correctional policies, practices and conditions of confinement. 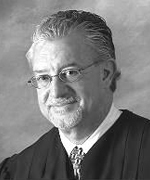 In 1995 he became a Senior Assistant Attorney General, and in 1999, Justice Siggins was named Chief Deputy Attorney General for Legal Affairs by Attorney General Bill Lockyer. As Chief Deputy Attorney General, he was responsible for the oversight and operation of the California Attorney General's Office. He remained Chief Deputy until he left the Department of Justice to join the Governor's Office in 2003. Prior to joining the Attorney General's Office, Justice Siggins practiced general civil litigation and maritime law in San Francisco with the firm of Acret & Perrochet (1980-1983), as a sole practitioner (1983-1985), and in the two lawyer firm of German & Siggins (1985-1988). He is a native San Franciscan, and graduate of St. Ignatius High School (1973). He graduated from Loyola Marymount University (B.A. 1977), and Hastings College of the Law (J.D. 1980). In 2004, Justice Siggins was recognized by California Lawyer Magazine as an Attorney of the Year for achievement in Government/Public Policy, and he was twice named one of the state's 100 most influential lawyers by the Daily Journal (2004/2005). In 2003, Justice Siggins received the Conference of Western Attorneys General Nelson Kempsky Award for outstanding leadership and management of an attorney general's office. Justice Siggins serves on several advisory committees to the Judicial Council of California in the areas of criminal jury instructions, audit reviews of the state trial courts, and the use and implementation of information technology in the courts. He is also a member of the Executive Board of the California Judges Association. He was retained in office by the voters in 2006 and 2010. Justice Siggins is a member and current chair of the Board of Trustees of St. Ignatius High School in San Francisco, a current trustee of the Santa Clara University Jesuit School of Theology in Berkeley, and a member of the Commonwealth Club of California. He and his wife Veronique Laband Siggins (1981) reside in San Rafael. They have four adult children and one grandchild.